St. Alban's, Acton Green, London. Left: West end with baptistry. Right: Three-quarter view of south side from the west end, showing the play area of the Caterpillar nursery housed in the adjacent green temporary building here. 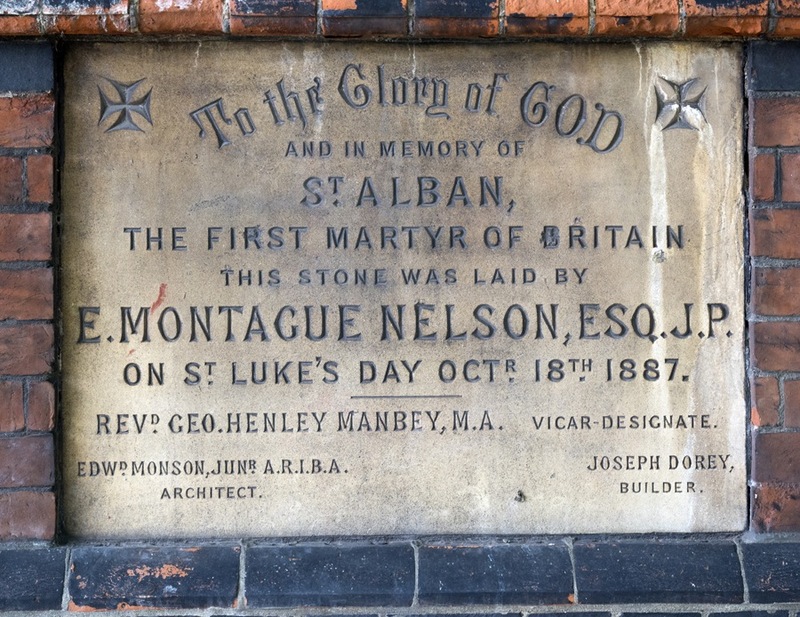 St Alban's on South Parade, Acton Green, London W4, by Edward Monson Jr. Foundation stone laid in 1887. Red brick with blue brick banding, stone dressings to ledges, and slate roofing. The Grade II listed building has a striking appearance because of the steep pitch of the nave roof, and the low and circular roof of the chancel, which ends with a modified apse (see "Churches: Acton"). It has been described as "a large raw red basilica" (Cherry and Pevsner 155), which sounds less than complimentary. 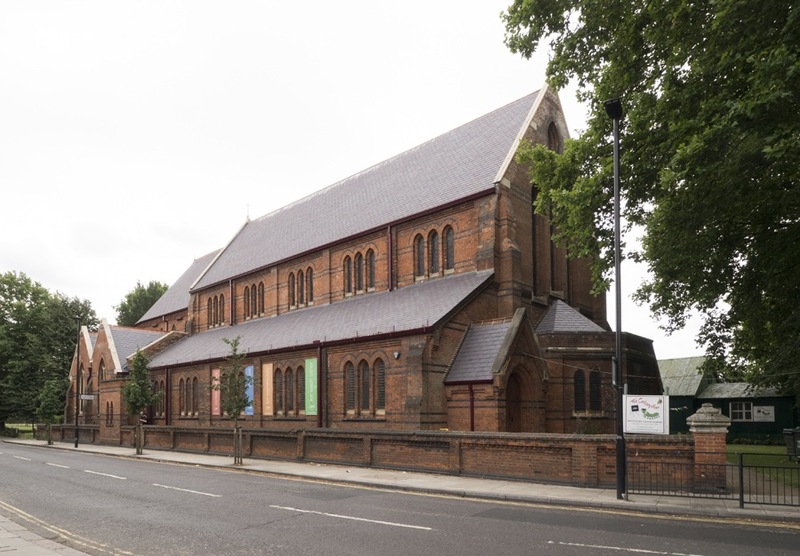 Yet Ealing Council, having quoted that very remark, recognises "its imposing architecture," and says that the church "acts as a landmark feature ... and adds distinction and interest to the streetscape" (5). Left: Three-quarter view of north side from the west end. Right: View of the east end with its apse and adjacent north chapel, and linked church hall on the left. 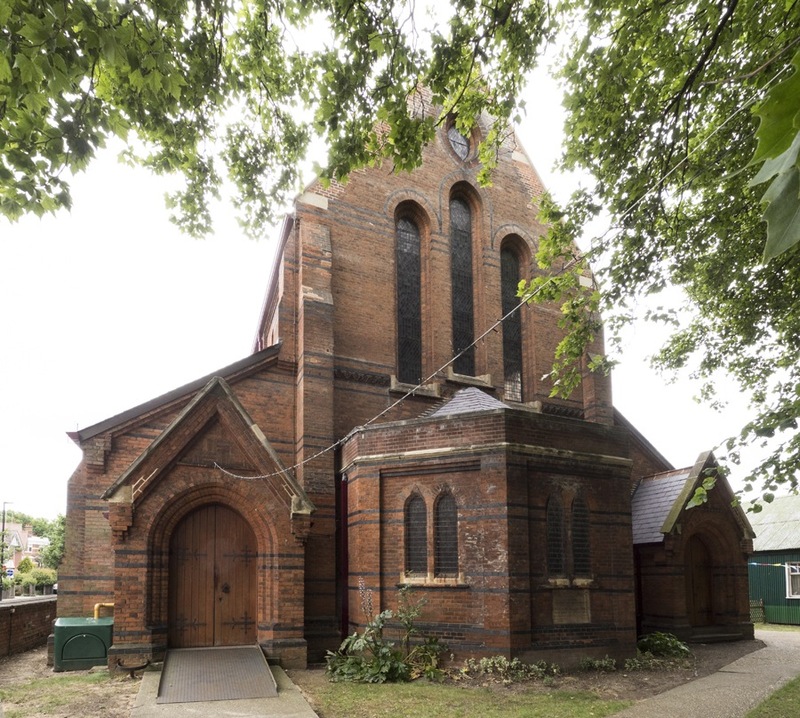 The church is capacious, intended originally to seat a congregation of about 750 ("Acton: Churches") with north and south aisles and a north chapel (added later, in 1908). 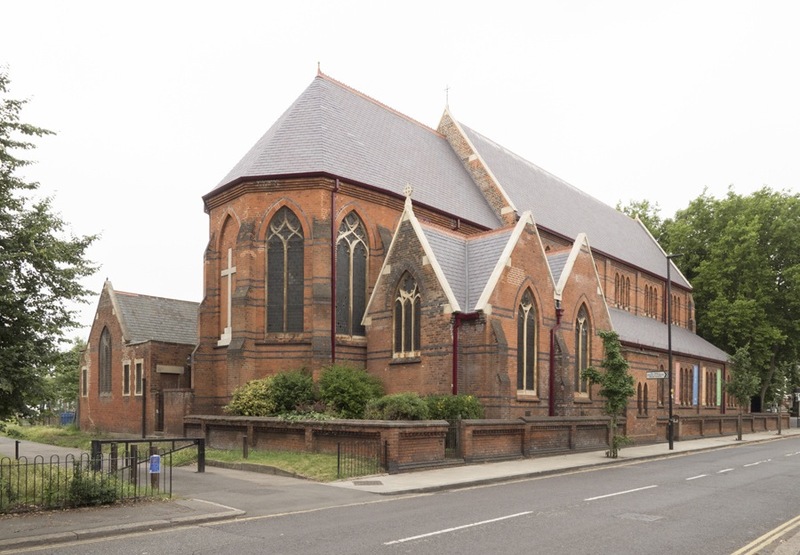 As would later be the case with Monsons' St Martin's Church in West Acton, the church's patron was the Bishop of London. According to the Morning Post of 20 July 1888, the Church Building Society made a grant of £175 towards it (3). Soon afterwards, on 23 August that year, the vicar-designate Rev. Manbey's was confirmed in his appointment, as noted in the Standard (6). Left: Next to the south side is the present nursery school. Right: Foundation stone. 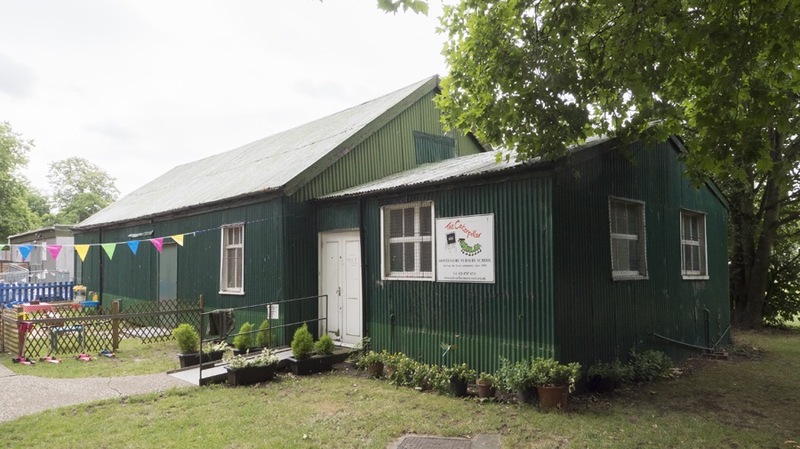 According to the local character appraisal document of 2008, the view of the church from the Green is "unfortunately obscured by the temporary church hall and club buildings (the latter in green painted corrugated iron)" (16). Appearances suggest that the green building here was originally a tin tabernacle, especially as we are told that the church had its origins in a mission run by another local church, All Saints, South Acton, and that mission services continued until the building was sold in 1938 (see "Acton: Churches"). From that account it seems that the mission church was sited in Acton Lane rather than on the Green, but these structures can of course be moved. Whatever its past history and use, the building now houses a popular Montessori nursery school called "The Caterpillar." Unusually, St Alban's church is in the process of being brought back to life after a long period of disuse. Pressure from the community has resulted in the rejection of plans for redeveloping it for residential use. "Acton: Churches." A History of the County of Middlesex: Volume 7, Acton, Chiswick, Ealing and Brentford, West Twyford, Willesden. Ed. T. F. T. Baker and C. R. Elrington (London, 1982): 35-39. British History Online. Web. 7 July 2017. 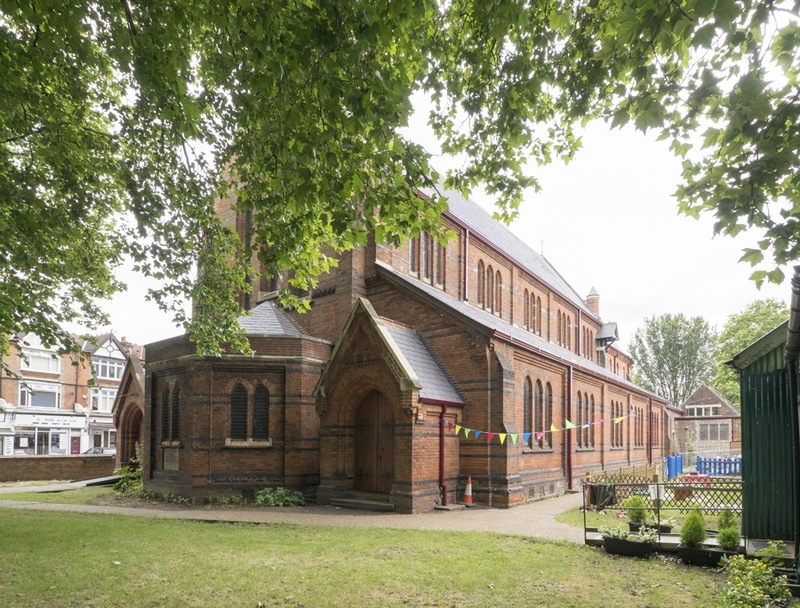 "Acton Green: Conservation Area Character Appraisal." Ealing Borough Council, March 2008 (available as a pdf download from Ealing Borough Council). Cherry, Bridget, and Nikolaus Pevsner. London: 3: North West. New York and London: Yale University Press, 2002. "Church Building Society." The Morning Post. 20 July 1888: 3 (issue 36221). British Library Newspapers, Part II: 1800-1900. The Standard. Thursday, 23 August 1888: 6 (issue 20006). British Library Newspapers, Part II: 1800-1900.